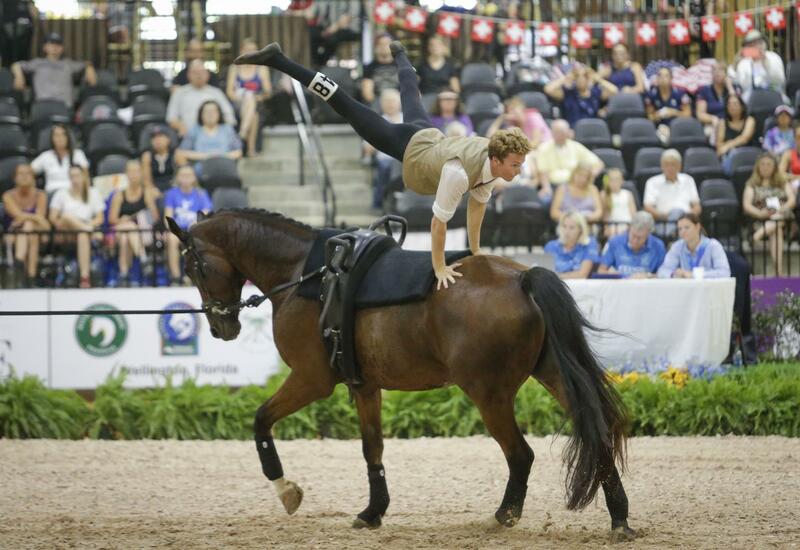 Mill Spring, N.C. – The U.S. Vaulting Team individual female and individual male competitors and squad took to the ring one more time at the FEI World Equestrian Games™ (WEG) Tryon 2018 on Saturday, September 22, for the final freestyle round. Chef d’Equipe Emma Seely led the U.S. contingent of Tessa Divita, Mary McCormick, Elizabeth Osborn, Colton Palmer, Kristian Roberts, and the Pacific Coast Vaulters on the final day of competition. In their best performance to date, U.S. Vaulting’s Pacific Coast Vaulters rocked the house in front of a home crowd Saturday evening. A nearly flawless performance by Daniel Janes (Monroe, Wash.), Audrey Kiernan (San Mateo, Calif.), Maggie Long (Seattle, Wash.), Kristian Roberts (Moss Beach, Calif.), Emily Rose (Santa Cruz, Calif.), and Haley Smith (Parker, Colo.) posted scores in the nine’s resulting in a final score of 8.000 for fourth place overall. 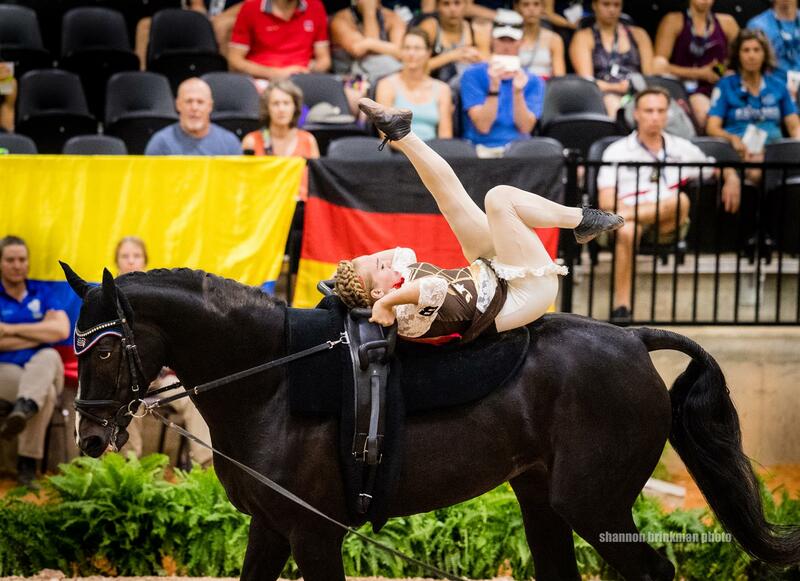 With gold medalist longeur Carolyn Bland on the line for Diva 506, Pacific Coast Vaulting Club’s 15-year-old Oldenburg mare, the vaulters performed at their best, feeding off the energy of being on home turf. The theme of the freestyle depicts the changing of the seasons, with each vaulter representing a change in the trees, while floating with grace aboard Diva 506. 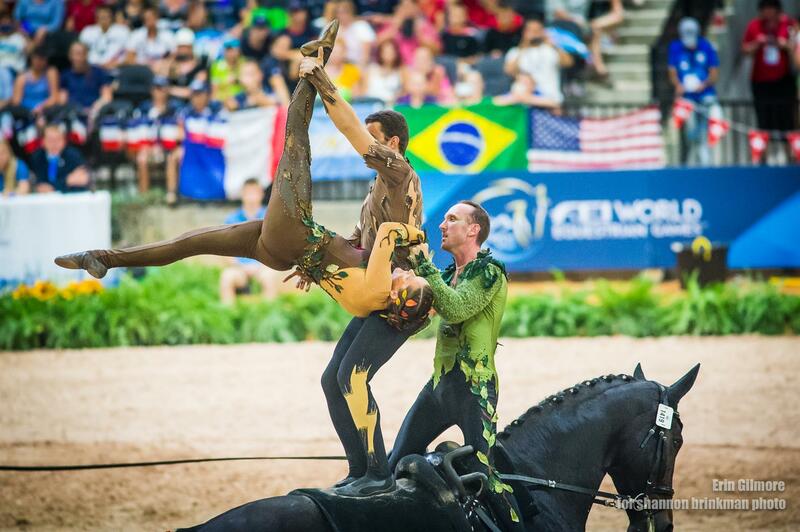 After their performance, as the last dismount landed Janes perfectly in the footing, the U.S. crowd cheered them home, elating a personal best score and closing out their WEG experience. Divita placed 14th overall in the Individual Female championship on a final score of 7.282. “This whole week has been such a dream come true,” said Divita. Osborn closed out the competition placing 11th overall. “My experience [at the WEG] has been pretty good! I’m sad that it’s over now, but it was great!” said Osborn. Kicking off the second and final round of freestyle for the Individual Male championship were U.S. vaulters Colton Palmer and Kristian Roberts. Roberts (Moss Beach, Calif.) with Sir Charles, Sydney Frankel’s 14-year-old Hanoverian gelding, and longeur Carolyn Bland vaulted first, earning a score of 7.109. “You can’t always have exactly what you want but I think I had some really good rounds this week,” said Roberts. “There are moments in the freestyle where you’re performing your choreography and you can take the time to take in the music, the moment… there’s nothing like that. And hearing the home crowd go crazy, it’s just overwhelming.” Roberts finished 15th in the overall Individual Male championship on a final score of 7.263. Palmer (Half Moon Bay, Calif.) with Zygo, Jill and Kimberly Palmer’s 14-year-old KWPN gelding, and longeur Maurits de Vries scored an 8.214 in the second freestyle, incorporating an impressive dismount characteristic of gymnastics. “The footing out here is amazing so I actually did that for the first time here. It felt very natural and was a [good] change for me.” Palmer finished 14th overall on a score of 7.678. Stay up to date on the U.S. Vaulting Team at WEG by following USA Vaulting on Facebook and US Equestrian on Twitter and Instagram, featuring a daily Instagram Story. Use #USAVaulting and #Tryon2018.